A good deep conditioning treatment is necessary for any healthy hair. Deep conditioners are formulated with ingredients that mimic the chemical substances that are found on the hair. Deep conditioners act as a temporary replacement for any nutrient that was lost during regular manipulation such as washing, styling and to the environments. Deep conditioning treatments are also formulated to address any hair issue such as dry hair, breakage, color damage and frizz. When used frequently and properly, deep conditioners can restore moisture back to your hair, improve elasticity and bring your hair back to life! Though deep conditioners won’t make your hair grow, they can help minimize breakage so that your hair can grow to longer and fuller lengths by addressing dry hair and breakage, which are often the causes of stagnant growth. 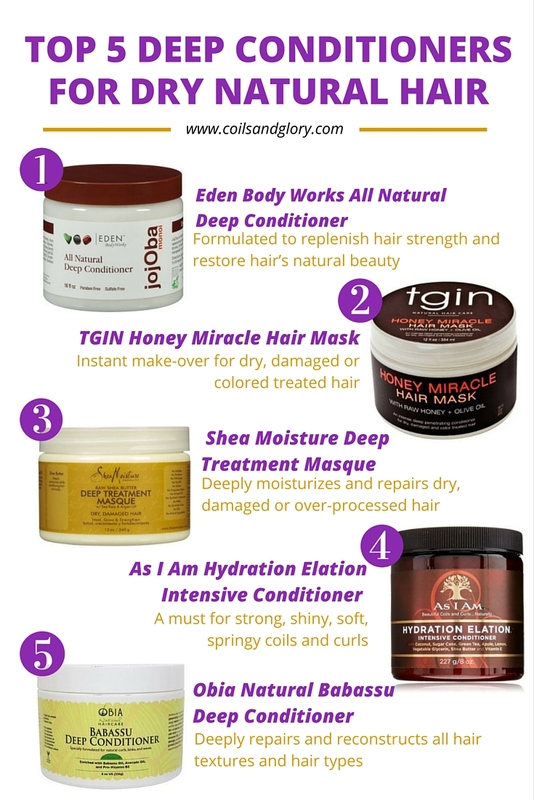 If you’re on a search for a good deep conditioner, here’s a list of 5 products that I recommend. Product Description: Jojoba All Natural Deep Conditioner strengthens hair through its botanical combination of Coconut, Jojoba, and Monoi. Formulated to replenish hair strength and restore hair’s natural beauty from over processing, damage, and dryness. Jojoba Monoi Deep Conditioner is fortified to balance the hair’s moisture level, resulting in stronger, healthier, more manageable hair. Excellent deep conditioner for all textures and hair types. Product Description: TGIN Honey Miracle Hair Mask is like an instant makeover for dry, damaged or colored treated hair. This luxurious deep conditioner contains raw honey for softer, shinier tresses and jojoba and olive oils, which nourish and heal strands in need of repair. The result is hair that never looked so good. Product Description: Shea Moisture Raw Shea Butter Deep Treatment Masque is an all-natural intensive treatment masque that deeply moisturizes and repairs dry, damaged or over-processed hair. It is perfect for transitioning chemically treated hair to natural. It has sea kelp for mineral-rich nutrition that seals and smoothes hair cuticles. Argan oil restores shine while helping promote hair elasticity. Shea butter deeply moisturizes while conditioning hair and scalp. Ingredients: Deionized Water, Butyrospermum Parkii (Shea Butter)*, Argan Oil, Vegetable Glycerin, Emulsifying Wax, Sea Kelp Extract, Panthenol (Vitamin B‐5), Essential Oil Blend, Avocado Oil, Lonicera Caprifolium (Honeysuckle) Flower (and) Lonicera Japonica (Japanese Honeysuckle) Flower extract, Tocopherol (Vitamin E), Hyssopus Officinalis Extract, Salvia Officinalis (Sage) Leaf and Equisetum Arvense Extract, Soybean Oil, Daucus Carota Sativa (Carrot) Seed Oil. Product Description: Scheduled maintenance with this deep-down hydrating and fortifying treatment is a must for strong, shiny, soft, springy coils and curls. This rich penetrating conditioner is an exceptional composition of extracts of coconut, sugar cane, green tea, apple and lemon, Shea butter, vitamin E and proven hair fortifiers. Product Description: Immerse your curls and kinks in this deeply penetrating, fortifying treatment that deeply repairs and reconstructs all hair textures and hair types. Strand-strengthening Babassu Oil will nourish, repair elasticity, soften, and add shine to your hair. Avocado Oil, Rosemary Essential Oil, and Pro-Vitamin B5 will moisturize, repair damage, and moisturize your hair. Restore your hair’s natural moisture balance. Ingredients: Purified Water (Aqua), Oryza Sativa (Rice) Bran Oil, Cetyl Alcohol, Stearamidopropyl Dimethylamine, Stearyl Alcohol, Vegetable Glycerin, Orbignya Oleifera (Babassu) Seed Oil, Centrimonium Chloride, Persea Gratissima (Avocado) Oil, Panthenol, Gluconolactone and Sodium Benzoate, Aloe Barbadensis Leaf Extract, Rosmarinus Officinalis (Rosemary) Leaf Extract, Citric Acid, Fragrance (Parfum).